This paper presents the development of a new stepclimbing mechanism for heavy load carriers. According to the method of measurement used, the results of experiments are given as the values of resistance and required driving force against a 10 mm step. The basic design of the proposed mechanism is illustrated, and a prototype is manufactured. Measuring impact acceleration using the prototype, we verify the accuracy of the mechanism CAE analysis. In addition, using the mechanism CAE analysis, we reveal the relationship between the angle, link length, and performance. Several experiments demonstrate that this prototype is able to drive over a 10 mm step, proving the effectiveness of the proposed mechanism. S. Kajiwara, “Parameter Study of a Step-Climbing Machine for Heavy Load Carriers,” J. Robot. Mechatron., Vol.26, No.3, pp. 341-348, 2014. K. Taguchi and H. Satoh, “A Study of the Wheel-Feet Mechanism for Stair Climbing,” J. of the Robotics Society of Japan, Vol.15, No.1, pp. 118-123, 1997. T. Iwamoto and K. Shibuya, “Concept and Mechanism of Robot Vehicle Using Variable Configuration Segmented Wheels,” Trans. of the Japan Society of Mechanical Engineers, Series C, Vol.71, No.701, pp. 171-177, 2005. D. Chugo, K. Kawabata, H. Kaetsu, H. Asama, and T. Mishima, “Configuration-Based Wheel Control for Step-Climbing Vehicle,” J. of Robotics and Mechatronics, Vol.19, No.1, pp. 52-59, 2007. M. M. Dalvand and M. M. Moghadam, “MSRox: Stair climber smart mobile robot (MSRox),” Autonomous Robots, Vol.20, pp. 3-14, 2004. A. S. Boxerbaum, P. Werk, R. D. Quinn, and R. Vaidyanathan, “Design of an autonomous amphibious robot for surf zone operation: part i mechanical design for multi-mode mobility,” Proc. 2005 IEEE/ASME Int. Conf. on Advanced Intelligent Mechatronics, pp. 1459-1464, 2005. G. Clement and E. Villedieu, “Mobile Robot for Hostile Environments,” Proc. of the Int. Topical Meeting on Remote Systems and Robotics in Hostile Environments, pp. 270-277, 1987. S. Hirose, T. Sensu, and S. Aoki, “the TAQT Carrier: A Practical Terrain-Adaptive Quadru-Track Carrier Robot,” Proc of IEEE/RSJ Int. Conf. on Intelligent Robots and Systems, pp. 2068-2073, 1992. R. K. Brown, “Stair-climbing wheel chair,” U.S. Patent 3283839, 1966. Y. Hosono and S. Yoshida, “Experiments and Development of a Mechanism Assisting a Hand-Propelled Wheelchair in Driving over a Higher Step,” J. of Japan Industrial Management, Vol.41, No.6, pp. 390-397, 1991. H. Ikeda, Y. Katsumata, M. Shoji, T. Takahashi, and E. Nakano, “The Method of Step Climbing Using a Wheeled Robot and a Wheelchair,” J. of the Robotics Society of Japan, Vol.26, No.2, pp. 200-209, 2008. Y. Takahashi, S. Ogawa, and S. Machida, “Step climbing using power assist wheel chair robot with inverse pendulum control,” Proc. of ICRA’00 IEEE Int. Conf., Robotics and Automation, Vol.2, pp. 1360-1365, 2000. M. Morales, A. Gonzalez, V. Feliu, and P. Pintad, “Environment adaptation of a new staircase-climbing wheelchair,” Auton Robot, Vol.23, pp. 275-292, 2007. M. Wada, “A 4WD Omnidirectional Wheelchair with Enhanced Step Climbing Capability,” J. of Robotics and Mechatronics, Vol.20, No.6, pp. 846-853, 2008. R. Morales, J. A. Somolinos, and J. A. Cerrada, “Dynamic model of a stair-climbing mobility system and its experimental validation,” Multibody System Dynamics, Vol.28, No.4, pp. 349-357, 2012. V. Krovi and V. Kumar, “Modeling and control of a hybrid locomotion system,” Multibody System Dynamics, Vol.28, No.4, pp. 349-357, 2012. H. Nakajima and E. Nakano, “Adaptive Gait for Large Rough Terrain of a Leg-wheel Robot: 1st Report, Gait Strategy,” Trans. of the Japan Society of Mechanical Engineers, Series C, Vol.72, No.721, pp. 2926-2931, 2006. S. Nakajima and E. Nakano, “Adaptive Gait for Large Rough Terrain of a Leg-Wheel Robot,” J. of Robotics and Mechatronics, Vol.21, No.1, pp. 12-19, 2009. E. Z. Moore, D. Campbell, F. Grimminger, and M. Buehler, “Reliable stair climbing in the simple hexapod ‘RHex’,” Proc. of the ICRA’02, IEEE Int. Conf. on Robotics and Automation, Vol.3, pp. 2222-2227, 2002. K. Tadakuma, R. Tadakuma, and S. Hirose, “Mechanical Design of VmaxCarrier2: Omnidirectional Mobile Robot with Function of Step-Climbing,” J. of Robotics and Mechatronics, Vol.17, No.2, pp. 198-207, 2005. D. Chugo, K. Kawabata, H. Kaetsu, H. Asama, and T. Mishima, “Development of a control system for an omni-directional vehicle with step-climbing ability,” Advanced Robotics, Vol.19, No.1, pp. 55-71, 2005. C. Chen, C. Feng, and Y. Hsieh, “Design and realization of a mobile wheelchair robot for all terrains,” Advanced Robotics, Vol.17, No.8, pp. 739-760, 2003. 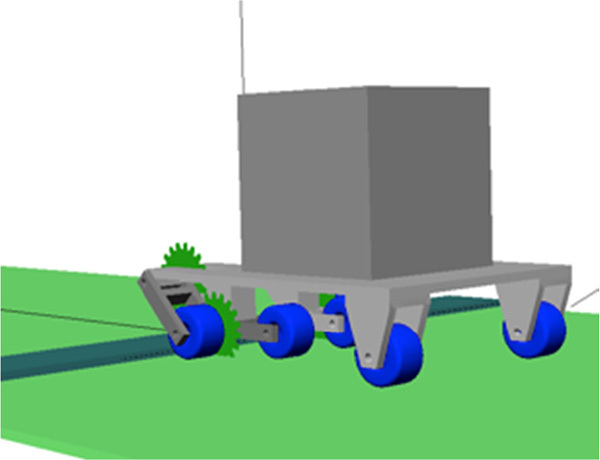 K. Taguchi, “Enhanced wheel system for step climbing,” Advanced Robotics, Vol.9, No.2, pp. 137-147, 1995. T. Kinoshita, Y. Mizukuchi, and M. Nakamura, “Study on the Impact Occurring by a Curb Step of Various Kinds of Shape in Wheelchair,” J. of the Japan Society for Welfare Engineering, Vol.13, No.1, pp. 16-21, 2011. K. Aoki, Y. Mizukuchi, M. Nakamura, and K. Aoki, “Study on the Impact Occurring by the Step in Wheelchair,” Trans. of the Japan Society of Mechanical Engineers, Series A, Vol.75, No.759, pp. 1542-1548, 2009. M. Higuchi, T. Shinagawa, H. Ito, Y. Takeda, and K. Sugimoto, “Improvement of Ride Quality of a Wheelchair When it Passes over Small Steps,” J. of Robotics and Mechatronics, Vol.19, No.2, pp. 181-189, 2007. J. Choi, C. S. Park, T. Kitagawa, K. Nakatani, and S. Sugii, “Development of a Step-Climbing Mechanism and Its Application to a Mobility Aid for the Elderly,” Technology Research Institute of Osaka Prefecture, Vol.22, pp. 53-57, 2008.